Based on the advanced technology from Germany, Italy, and Taiwan, we developed this new type of bottle cooling machine. Its working-process can be divided into three stages: circulating hot-water spray-cooling, warm-water pre-cooling and cold-water cooling. The cooling-heating temperature can be regulated according to the requirements of the user. It is suitable for cooling and heating all kinds of bottled or canned hot beverage or carbonated beverage. It is equipped high temperature-resistant polypropylene (CPP) chain. This machine is made of SUS304 stainless steel and it is reliable in running and has beautiful appearance. This machine is absorbed the abroad equipment technology and newly-designed, using circular cooling water in five cooling section to cool the fulfilled bottle step by step. During cooling, it will accords to customer's requirement to adjust speed by inverter, which is suitable for cooling of all kinds of hot material. 1. The whole body is made from stainless steel (horse, bearing, engine excluded), observing window can be set to around the base, the top structure can be opened for easy maintaining. 2. The recycling filtering device and alarming system is equipped to the water gathering slot in the cooling tunnel. 3. Fringe board is heat-endurable net fringe flat and abrasion-endurable. 4. Overload protecting device in the main engine to protect fringe board and conveyor system effectively. 6. Spraying recycling water pump and antiseptics pump equipped. 8. 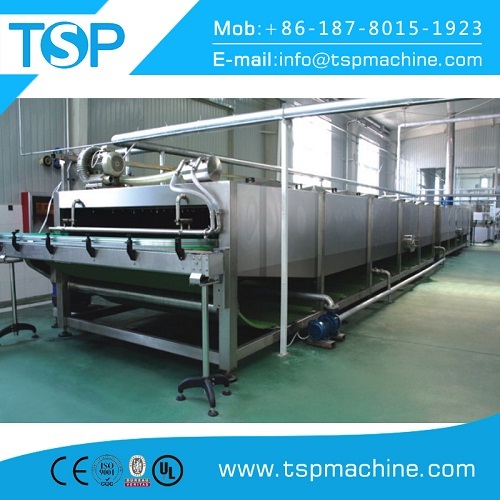 Using uniform spraying supplement, in the first zone, to prevent water temperature change fiercely.